I went to an excellent talk a couple nights ago at Brown University’s Watson Institute for International Studies, to hear the very talented legal scholar Amr Shalakany discuss his new book, Izdihār wa-Inhiyār al-Nukhba al-Qānūniyya al-Miṣriyya, 1805-2005 (“The Rise and Fall of the Egyptian Legal Elite, 1805-2005”). Amr is the Aga Khan Distinguished Visiting Professor of Islamic Humanities at Brown this term, coming to us from the American University of Cairo, and it has been wonderful having him around. 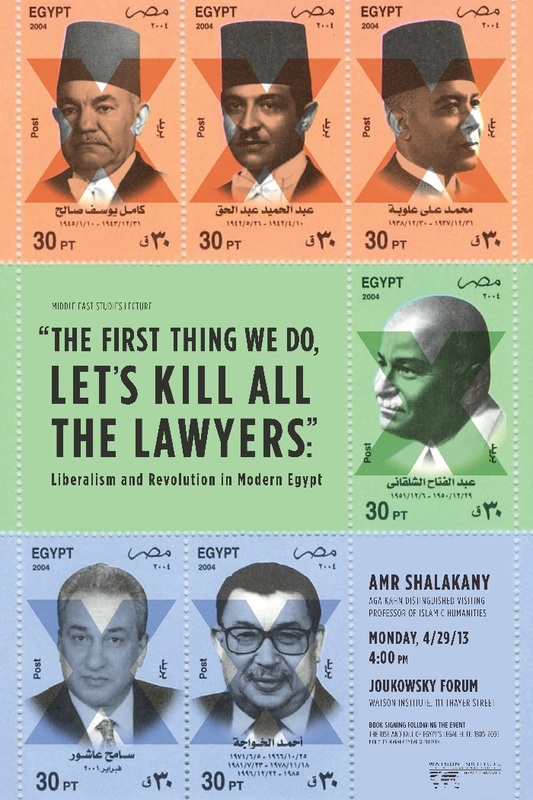 As this review in al-Ahram lays out, Dr. Shalakany’s book tells the story of Egypt’s legal elite from its heyday during the 19th and early 20th centuries, when “this class of politicians, intellectuals and visionaries who, in fighting the battle for national independence, forged almost every aspect of social, intellectual and economic life in Egypt’s liberal age. This age ended abruptly with the military-based change of regime which came about as a result of the 1952 Revolution.” Under Nasser, Sadat, and Mubarak, the legal class would suffer one debilitating blow after another, setting the stage for the current crisis facing Egypt today, which, as Amr pointed out in his talk, has major legal valences. Much of the discussion stemmed from the famous incident of the 1954 assault upon `Abd al-Razzāq al-Sanhūrī, an eminent jurist and head of Majlis al-Dawla (the State Council), who was the principal drafter of the Egyptian civil code as well as the author of a massive commentary upon it. According to the well-known narrative, al-Sanhūrī was physically attacked in a demonstration on March 29 1954 because he and the Council had opposed the emergency laws established by Nasser’s Free Officers in 1952 and were advocating a return to the constitutional and parliamentary status quo. As Shalakany pointed out, though, al-Sanhūrī and the Council had been instrumental for the previous two years in providing legal cover for the Free Officers to suspend political party activity and to establish a Regency Council without having these measures approved by the Egyptian parliament. (For more detail on this, see Nathan Brown’s The Rule of Law in the Arab World, pp. 74-75). Why would someone like al-Sanhūrī, the paragon of the rule of law in Egypt and the Arab world, the greatest Arab jurist, the man whose tome on the civil code must exist in the office of any self-respecting Arab lawyer… why would a man like that, whose name is associated with the rule of law and who comes across today as a hero, spend two years supporting the military and breaking everything that has to do with the rule of law? In the Q&A period, I asked Amr to expand on this theme, which he had not developed much further in the talk. Admitting that he was still working on it and thinking it through, he made the following point, which I think is worth quoting in full. There’s just a fundamental contradiction between, on the one hand, protecting individual rights and, on the other hand, saying, “I’m into democracy.” The individual is the major counting unit for liberal legality; the demos or the people are the major counting unit for democracy, and the two must — intellectually and in reality — clash with each other, and have historically clashed. So we had liberalism in Europe way longer than we had democracy. France, England, Germany, Italy: all of these had liberal legal systems well into the 20th century but not democracies. And lawyers could perform their role as defenders of liberalism without having to also perform their roles as protectors of democracy. It’s only in the 20th century onwards when suddenly liberalism and democracy came to be conjoined together and we have these hyphenated regimes of liberal and democratic that the fundamental contradiction between liberalism and democracy emerges. Maybe that’s another way of explaining it. It’s a bit too theoretical and needs to be fleshed out but I feel that many of [the Egyptian judges] are happy with liberalism but not with democracy, just as many elites in Italy, France, and England in the 20th century were happy with liberalism but not with democracy. A final point that I found very interesting in the Q&A was Amr’s suggestion that almost all of the main players in Egypt today are actually liberals, according to the classic definition. “We are all liberals today, whether we like it or not,” he proposes. Both Islamists and secularists use the language of liberalism in advocating their visions for the country, and even the Salafists — who are calling for a return to sharia — are also using the language of liberalism by speaking of constitutions and guaranteed rights, etc. The New York Times and the Economist on the other hand, use misleading language by saying things like: “There are two sides in Egypt: Islamists and liberals.” Such a characterization is not only factually inaccurate, but also politically dangerous. Why? Because it obfuscates the distributional stakes that are present when we are discussing these terms. So instead of saying “liberals and Islamists,” one should be saying “left and right”. One should be saying “people into public property, or redistribution, or the commons, or whatever term we use for a redistribution of wealth or power in Egypt,” versus a conservative take on the economy. The Muslim Brotherhood which rules Egypt today, if you read their economic program… [you’ll find] that it is more neoliberal than the economic program of Gamal Mubarak, the son of Hosni Mubarak. These were just a few of the several very interesting aspects of the talk that I wanted to highlight, but you can watch the whole thing here if you’re so inclined. I recommend it. The underlying issue, of course, is whether other forms of government can protect liberalism better than a democracy can — not that democracy always does it well. We are in a rather illiberal era now, it seems to me, though nowhere near the depths to which we descended during the first world war. But it doesn’t appear that the Egyptian revolutions, then and now, have done better. Let’s be straightforward that no woman has been able to bring forwards any solutions to the plagues we have been discussing on this blog to find a way forwards for humanity for some time. I think the only super woman that has had the courage to bring forwards her humanity is Christiane Amanpour. I bless her. Under Nasser, Sadat, and Mubarak, the legal class would suffer one debilitating blow after another, setting the stage for the current crisis facing Egypt today, which, as Amr pointed out in his talk, has major legal valences. You mean it wasn’t Israel’s fault. This isn’t going to sit well with Lala. Is Zaatar the New Ras el-Hanout? Should Lebanon Default On Its Debt?